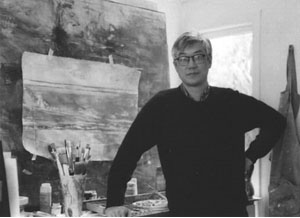 James W. Mah was born in China in 1949. When he was four, he started drawing airplanes and found out he liked it. When he was six, his family immigrated to Saskatchewan, where he did not learn to play hockey. This, and the excellent prairie light, would help steer him towards a career in art. He was fortunate to have had teachers that encouraged him, most notably Miss Laura Chapman, his Grade 5 teacher, who had studied with Lismer and was the administrator for the Emma Lake School, and also Mr. George Dyck, his high school English teacher, who took care of the art collection there. He was taught for four years by Reta Cowley, who gave him his first palette knife. He entered the University of Saskatchewan and took some painting classes with Donald McNamee. In 1969 he studied drawing and design, most memorably with Lawrence Kristmanson, and Fred Amess, at the Alberta College of Art. The art history teacher also made an impression on him; he was forever showing him slides of the North Portal of the Erechtheum and other architectural masterpieces, with all the ardour of a man who had missed his calling. The artist declined his scholarship at ACAD and decided to enter the School of Architecture at UBC. He emerged with an architectural degree in 1975 and an architectural licence some years later. He worked in the Vancouver Planning Department, in commercial Interior Design and with various architectural firms. He left the profession in 1989 to return to the easel. His printmaking studies include an etching class with Orville Fisher at the Vancouver School of Art and later with Lone Tratt at the Dundarave Print Workshop. His monotypes portraying the Greek myths were shown at the Vancouver East Cultural Centre. He had a show of figurative paintings at the now-defunct Torres Gallery. His last major show was at the Richmond Art Gallery where he presented his oil paintings based on the themes of water and rain. In a world where we are bombarded constantly by visual images that are so exquisitely finessed to meet their commercial and exploitative goals, whether these are the enhanced photos of young models or computer-generated special effects in the movies, that an artists tries to produce images that offer a different view seems like an important thing to do. When compared to the visual pyrotechnics inherent in much of what Media feed us today, the relative paucity of the means available to the visual artist is really a blessing in disguise, as it allows the artist to communicate in a simpler, more individual, and hopefully more satisfying way. The artwork is ultimately an extension of the artist’s mind, and a vehicle for connecting with others, even if the medium requires a sense of quiet receptiveness that is getting all too scarce in this world of overwhelming visual noise. My work can be put into three main categories. There is “literary” work that reflects my interest in opera, plays, poems, and to which I would include my interest in personages (portraits). There is “lyrical” work that is inspired by Nature and all she has to offer. Finally, there is the “polemical” work in which I record my dismay at many negative aspects of modern life, at the ecological and political disasters that threaten to engulf us all. I start with an idea (sometimes just half-formed) that I try to take quite diligently to completion. This is the 'objective' phase of my work process and I use it to warm up. The interesting pieces which emerge from this 'objective' phase I keep. The rest are put aside, to be worked over weeks or sometimes months later with an entirely new subject unrelated to the original work. I find it helpful to start with paper or canvas already bearing marks, as these can suggest a new image (much as Leonardo reported seeing ideas for paintings in stains on old walls), especially to a mind already tired by objective work and primed for subconscious input. Georges Braque once described painting as removing a layer of dust from the canvas with his brush, and releasing the image that is already there; I work using a similar method, in which the subconscious mind reclaims the territory of the conscious. This process is not automatic but is seeded by what I see or read in the news, on television, or anything that sticks in my mind from my daily existence. Eventually these elements do find their way onto the canvas. The final effort is then directed towards the analysis and rendering of these "retrograde" memories or mental images. Constant re-evaluations of the work alternate with repetitions of this cycle. It is becoming increasingly important for me to try to keep the images “open-ended” so that different viewers can take away different things from the same work. One of the intriguing things about art is that one does not have to be entirely clear (in the way that we were all taught to write clearly in grade school) but on the contrary, that an inchoate statement may be better than one in which everything is completely said and which ultimately closes the door completely on interpretation. My printmaking is a different process, because printmaking has more technical considerations than painting and requires a little more organization. I've approached printmaking from a painter's perspective in that I usually try to make unique prints (e.g. monotypes) or variable series. I hardly ever do editions, although with reduction linocuts this is unavoidable. I enjoy mixing different printmaking techniques as the challenge puts me in the position of the constant novice in whose eyes the process is flexible, the constraints unknown and the unpredictable results are but a happy accident leading to new possibilities. Currently I am working on a series of paintings where I look at my feelings about consumerism, cars, pollution and similar themes. I am also translating some of Baudelaire's poems into English with the aim of making a book with original prints illustrating each poem.